So it is with Ballet Theatre UK’s new version of The Nutcracker, the quintessential Christmas ballet based on a story by E.T.A. Hoffmann, Der Nussknacker und der Mäusekönig. As the UK’s newest ballet company, and given that it’s probably the most performed ballet in the world (first staged in London in 1934), director and choreographer Christopher Moore has worked wonders to bring this tale up to date with modern sets and costumes. There are two alternating casts of ten dancers, meaning that they all work double time with the costume changes and Moore has choreographed the ballet to suit his Company. It’s an exciting prospect – new choreography in a classical full-length narrative ballet – and you’ll be pleased to know that there is more in the pipeline. The scene unfolds one evening where a mother and her daughter Clara (Megan Wood), are hosting a party. Danced with great characterization, warmth and grace by Maria Engel, the mother is busy in her role as hostess, making sure all of the guests are happy, as you would. 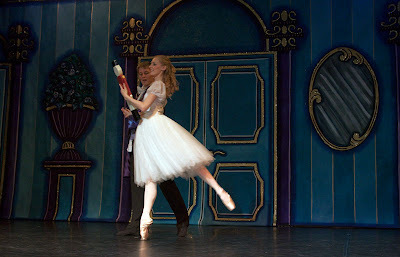 One of the guests is Clara’s uncle Drosselmeyer, who presents her with a Nutcracker doll. 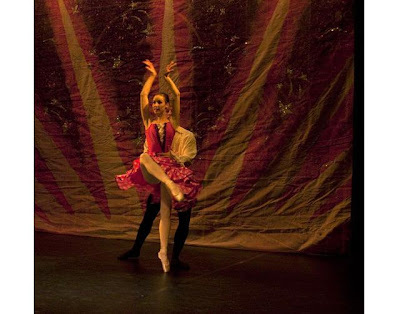 Pere Bodi Perez has the nimble footwork and magical aura needed to capture the guests’ attention when he introduces two dolls – Columbine and the Harlequin doll, brought to life brilliantly by Natalie Cawte and Diarmaid O’Meara. 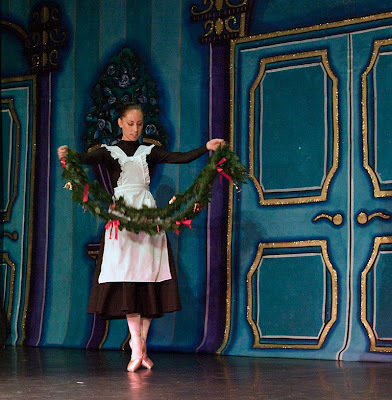 As Clara tiptoes wide-eyed down the stairs at midnight to fetch her Nutcracker, Drosselmeyer is waiting for her. He sends her off on a journey where she battles the Rat King & is rewarded for her bravery when her doll turns into a handsome Prince. By now you might be wishing you had your own Drosselmeyer. 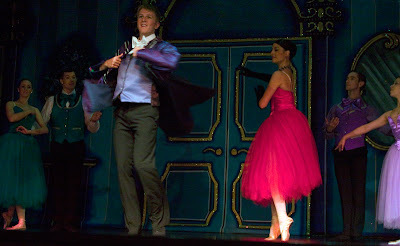 The handsome Prince, (Diarmaid O’Meara), whisks Clara away to the Land of Snow and the Kingdom of the Sweets, where they find the Sugar Plum Fairy (Maria Engel). Tchaikovsky's “Valse des Flacons de Neige” – the Waltz of the Snowflakes, begins with curling, cascading music, much like the snowflakes themselves. 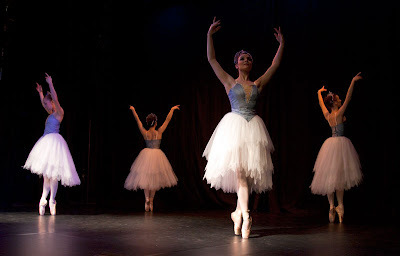 Danced by Maria Engel, Alexandra Fern, Natalie Cawte and Amy Coughlan in beautiful costumes designed by Moore (as are all the costumes), the Snowflakes are joined by Kazuka Oike in a dazzling white and silver tutu and waltz in perfect time to a glittering backdrop. Reaching the Kingdom of Sweets, Engel, as The Sugar Plum Fairy, shimmers and glides, delicately picking through the music. O’Meara gave a clear and impassioned rendition of the mime sequence, all hand gestures, where he describes their adventures to the Sugar Plum Fairy, who presents him with a medal. 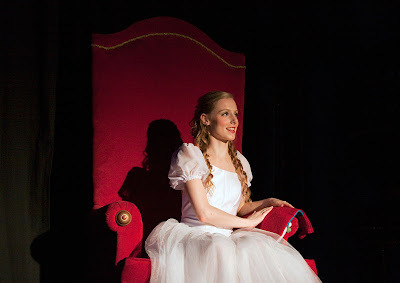 Clara receives a diamond necklace and the pair is invited by the Sugar Plum Fairy to take part in a celebration, where she will dance in their honour. The divertissements which follow are great fun and also relate to gifts of hot chocolate, coffee, tea & candy canes from their relevant country. In terms of technique in the Spanish dance, I couldn’t tell Alexandra Fern apart from Royal Ballet Principal dancer Laura Morera, so sharp was her footwork & characterization. Plenty of swirling skirts and imagined castanets, ably partnered by Sam Bishop. Coughlan and Perez had good timing throughout. Natalie Cawte hasn’t put a foot wrong wherever I’ve seen the Company, and in the Arabian dance she had a sinuous technique with charisma and joie de vivre to spare. Her use of space is excellent and she has a strong technique, visible not only in her slow, controlled drop into the splits, unsupported, but also in the lifts, walking over her partner Chris James’ thigh to sit on his shoulder; she was a joy to watch. It’s a tough dance on the back, but you wouldn’t have known as both brought out the full flavour of the piece. 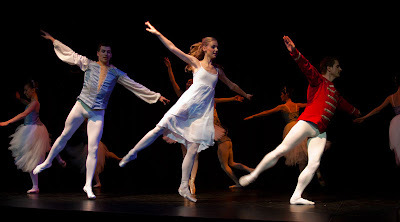 The Russian dance, or Trepak (a bravura traditional Ukrainian folk dance in 2/4 time) is played in a presto tempo with deep squats and split leaps, and is performed exclusively by men. It’s a testing feat where Perez and Bishop did themselves proud, and with O’Meara in the mix you have three Cossack dancers ready to raise the roof. Bishop in particular looked to be thoroughly enjoying himself; it was infectious. The ending, when Clara jumps sideways into all three pairs of hands was done at speed and with great panache. Oike lights up the stage with her beaming smile and fills the space with delicate balances and jumps. The music you know so well from the Fruit & Nut adverts, the Dance of the Mirlitons, fills the air and Cawte & Coughlan appear in Broadway top hats, pink gloves and stripy tutus. Wood, as Clara, joins in and all three had great timing and some really sassy moves. Special mention has to go again to Cawte for her sharpness and great hand shaping. Fern and Bishop danced the Polichinelle (Clown) variation with great aplomb, in deep blue costumes, he with a snazzy multi-coloured belt, she with flowers in her hair and fun on her mind. Her fouettés were spot on and both were sharp. 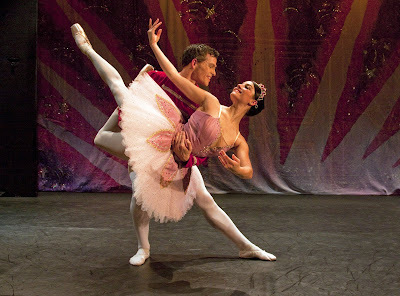 The Sugar Plum Fairy hands Clara a quite giant rose, signalling the start of the Waltz of the Flowers. 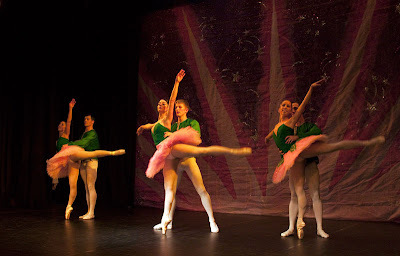 In sparkling pink tutus, Oike, Coughlan and Cawte swirled their way through the music; Cawte looked especially to be enjoying herself, with strong balances. Partnered by Perez, Bishop and James, waltzing in a circle might have even the celebrities on Strictly Come Dancing in a spin but they held together well. 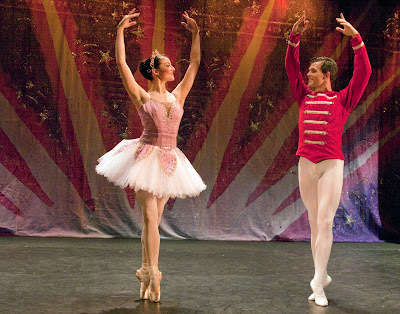 No matter how much fun you’ve had so far, The Nutcracker stands or falls with the famously tricky Intrada, variations and central pas de deux of the Sugar Plum Fairy and her Prince. Here Engel tones down her inner hostess and is serene & regal, stroking the floor with her feet; perfectly matched by O’Meara who has long elegant lines especially in his first solo. In an already difficult solo, The Sugar Plum Fairy dances a series of Gargouillades, essentially a pas de chat variation with a double ronde de jambe on each foot. It takes a brilliant technician to get this step right especially on the closing leg, and I’ve not seen it danced this well before. Engel turns well and has beautiful soft feet, but don’t think Sugar Plum gets all the limelight; where would she be without her Prince, and O’Meara’s jumps are high & plush with lovely soft landings. O’Meara and Engel both have beautiful phrasing on their own, but together their phrasing becomes a conversation in the central pas de deux and it’s one that the audience want to hear. This section was labelled by Tchaikovsky as “Andante maestoso”, or “flowing majestically”, and with these two, it does. O’Meara’s exemplary partnering skills are evident in his effortless high lifts, Engel sitting on one shoulder, and into the swooping fish dives so characteristic of this dance. The final fish dive was marvellous. The closing waltz ends with Clara lifted up high while the others slowly twirl off the stage in each corner. Clara wakes up and finds herself at home; did she dream it all ? Did we ? Well, lucky Clara has the diamond necklace ! You can read interviews with Amy, Natalie and Alexandra, and more will follow shortly. Oh, what a magnificent post. The photographs are spectacular. The Nutcracker is my favorite ballet. I have shared this ballet with my family and friends from New York to Toronto to Hong Kong. The costumes look wonderful. I am always amazed how each ballet company expresses their creativity a bit different with stage sets and costumes. It must be magical to see the London Ballet Company perform this. I just love the nutcracker. The photos are breathtaking. Thanks for you comment. I liked your blog very much. Sounds like Miss Fern is somebody to look out for in the future!! I am going to watch in York can't wait. Elise darling, this is an incredible post, it brought back so many wonderful memories for me. Thank you darling for sharing and thank you for the sweet comments you leave for me, you are a dear dear friend, I am so lucky!! so so so very beautiful and so inspiring, WOW. The costumes are so lovely and I really love the turquoise color in the set. Our Honolulu symphony has gone bacnkrupt! OUR Nutcracker may be to recorded or amateur music! What a beautiful collection of photos. They bring back so many pleasant memories. 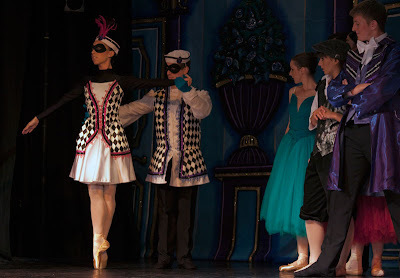 My children and grandchildren had the fun as appearing as little children in Le Grande Ballet Canadienne's performances of Nutcracker - over the years. You live, work and breathe in a magical world! Oh how beautiful! I just love the Nutcracker. 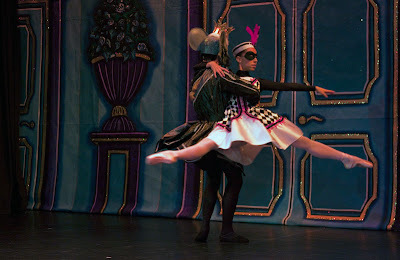 Nutcracker was the first ballet- I will always cherish this memory! oh wow gorgeous photos, love reading your blog. The Nutcracker looks and sounds gorgeous! The Nutcraker looks wonderful! I look forward to read your next post. Please come and visit my site anytime. Popped in from Pink Tutu to say hi! 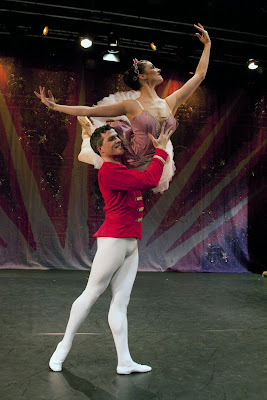 I love the Nutcracker! I really want to see it this year! This looks beautiful! I really want to see it! Gorgeous photos! gorgeous! i'm always mesmerized when i watch ballet! I've always wanted to be a ballerina. Not to sure whether or not I'd be good at it though! Julie Harward - well, you can always watch ! Anonymous - Well, not just in the future, now is a good time too ! Hope you enjoy York - please report back ! Duchess of Tea - how lovely, I'm so pleased. Thank you darling Duchess as ever ! Shirley - Well, I look forward to seeing the results ! Thank you for your compliments ! Silke - thank you very much; it's very kind of you to say so. Hope you get to see Nutcracker.. Christmas isn't the same without it. Couture Cookie - Do you still have your costumes ? Amarjeet - thank you for your comments. 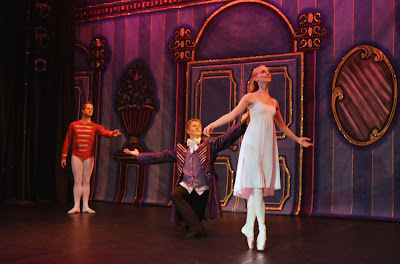 I'm not sure about the link you have posted - did you want more details about this production of the Nutcracker ? I hope you do get to see it - all the booking details and links are in the post so I hope that helps you. Couture Carrie - thank you darling. Who doesn't ? Bonnie - thank you and yes, it does feel that way most of the time..
Kerri Lynne - Then it's high time he listened ! Please do let me know if you manage to twist his arm and what you thought of it..
~ Kelly Ann ♥ - lucky you ! Poppy - you are tutu kind ! The Blonde Duck - hi ! I hope you get to see it - and do let me know what you thought ! beedeebabee♥ - I agree, what's not to like ? Lilee - thank you - I hope you get to see it for yourself..
BB ♥ - it doesn't matter - you can always have a go. Thank you so much for this post! Brightened my day. I bought tix for the Nutcracker in Miami last year and it was cancelled, was so disappointed. There is something about it that makes me all warm and tingly. Simply Colette - what a shame ! 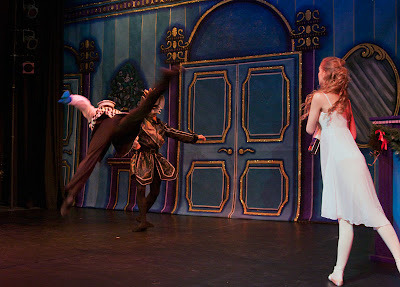 But you could always try again now... hope you get to see a Nutcracker somewhere this Christmas ! nkt - thank you very much and welcome ! Chickpea - thank you for your comment; I certainly wouldn't take it the wrong way. I can assure you that I am entirely independent, which is why you get an impartial view on this site. It is a shame that you haven't had a chance to see this Company perform; I think you would be surprised at how good they are - I know I was. Of course they are not perfect, and I have not said that they are. No dancer will ever be truly happy with every aspect of a performance and it would be foolish to suggest otherwise. What I have kept in mind when writing this review is that some of the dancers are fresh out of school, this is their first professional job, and so I balance that against the need for fair and balanced journalism. In instances such as these I prefer to leave out anything that wasn't great, as long as it doesn't have a major impact, rather than highlight it and risk leaving the dancers lacking in confidence. Imagine how you would feel if you'd spent 10 years training hard and then someone came along to your first performance and wrote about everything that was wrong ? I think you still get a balanced review and where I have highlighted a dancer it's because they really were that good. It's more positive that way. The Royal Ballet are far from perfect and I've said so plenty of times here. So too Scottish Ballet and BRB; you only have to read the posts. A review is just that - and will be critical where necessary - the appropriate place to talk about improvements is in the rehearsal studio.